Could these small switches help you put an extra £500 a month in your pension? Putting money aside can be difficult, and saving for a pension is something that many people push to the back of their minds. But if you start saving now, your future self will thank you. The great news is, we reckon you could squirrel away up to £6,372 a year by tweaking your lifestyle slightly and making a few simple switches. We’re not suggesting you give up all the pleasures in life - just that you give them a bit of a shake-up. Here’s how. An Open Table study last year revealed that the average Brit eats out six times a month and spends up to £53 per meal, bringing the average annual restaurant spend to £4,000 per person. It’s a hefty sum, and although there are always going to be occasions when it has to be a restaurant meal rather than something cooked at home, there are also those times when you eat out because you can’t be bothered to think up a meal idea, shop and cook. Cutting down restaurant meals by three quarters could mean a £3,000 annual saving. That’s an extra £250 a month for your pension. We all know that bringing our own lunch into work rather than splurging on a shop-bought sandwich or salad is a good way of saving, but the actual amount you could save is quite staggering. The average annual spend is an eye-watering £1,840. Vouchercloud.com research last year suggested that 62% of employed Britons buy their lunches, and the average annual spend is an eye-watering £1,840. Those who bring their own food from home spend just £552 a year on average. If you think of soggy sandwiches and sadness when you hear the words ‘packed lunch’, it’s time to rethink. There are tons of options for inspiring homemade lunches online, and making extra dinner and bringing the leftovers into work is also a cheap and hassle-free option. Switching to packed lunches could save you an impressive £1,300 a year. That’s a tidy £108 a month more for your pension. A shop-bought latte or cappuccino can easily set you back £2.50, so it’s not surprising that research from Buddy Loans last year showed Brits spend over £608 a year on fancy caffeine hits. If you’re going to find it hard to kick the coffee habit altogether, just quit the shop-bought stuff. A stove-top Moka pot is one of the cheapest options for homemade fresh coffee, setting you back around £41.40 a year, including the initial outlay. Pour into a Thermos flask for work and you’re good to go! Making a Moka pot of coffee at home instead of buying a coffee out each weekday could save you an annual £566. That’s an extra £47 a month in your pension. Shoppers who started buying supermarket own-brand products rather than branded goods saved an average of over £1,200 a year according to a Voucher Codes Pro poll last year. It’s an impressive amount, and in many cases you’ll notice little difference in quality between the recognisable brand and the supermarket’s own version. Start putting unbranded goods in your basket, and see whether your receipts start shrinking. Also, make sure you’ve got a loyalty card for your local supermarket: the points can add up to some substantial savings. If you manage to save £1,200 annually, that’s an extra £100 a month for your pension. Recent government figures show that, of the UK households that use gas and don’t have a pre-payment meter, well over half could save £200 a year plus by switching to a better energy deal. Of these people, around 9.5 million could save over £300. Meanwhile, switching bank accounts can now save the average Brit £116 a year. There are online platforms that can help you switch your energy supplier. The government figures show that the best deal on average costs around £765 per year for gas and electricity. Suppliers also offer more competitive prices for direct debit, so shift to this payment method if you’re not using it already. Most banks offer a switching service so you can move your accounts to them with minimum hassle. They’ll move your salary payments, direct debits and standing orders for you, and will often also give you a cash bonus for making the switch. If you make the average saving for both utility and bank account switching, that gives you an extra £316 a year or £26 a month for your pension. If you make all of these small switches, you could put an additional £531 per month into your pension. This could make a huge difference to your pension pot at retirement. 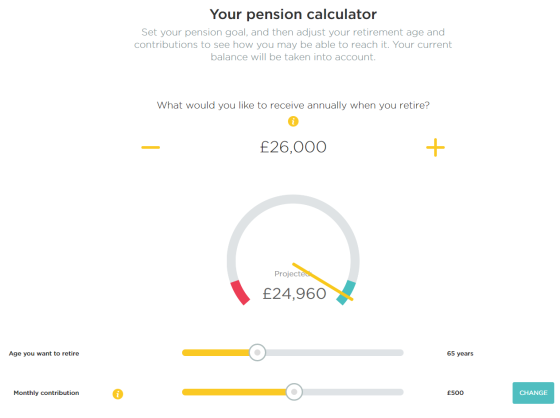 You can play around with our pension calculator to see the sort of impact this could have. For instance, these images show the impressive impact that it had when we upped monthly contributions from £100 to over £500 a month (on a pot of £50k). Bear in mind these are projections that are based on assumptions and are not guaranteed. 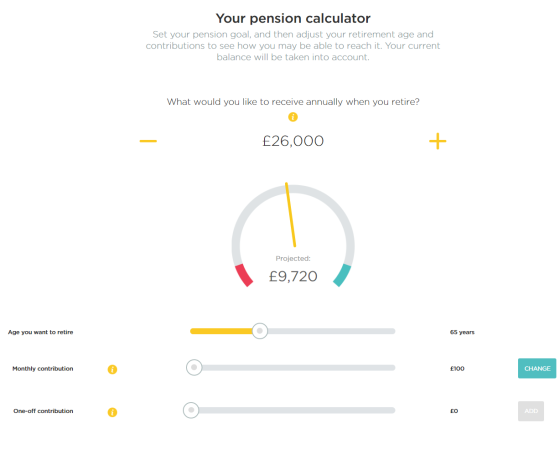 For more information on how the calculator works, check out the help text on our pension calculator page. Be more thoughtful about food and throw less away. The average Brit chucks £39 worth of food away each month. If it’s possible, cycle or walk to work rather than shelling out on bus or train tickets or fuel and parking. Save your small change. Try an app like Moneybox, which automatically rounds up your card payments and puts the extra into an ISA. If you get a pay rise, pay the extra money each month into your pension or savings account. 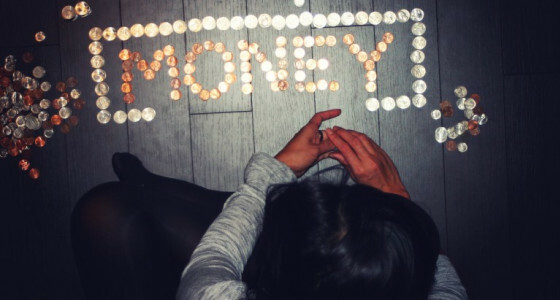 Are you an obsessive saver? What tips would you add to the list? Let us know in the comments section at the bottom of the page! If you’re saving all that extra cash, you need somewhere to put it! Get a modern, online pension plan today.